In a follow up to our recent episode of That God Show, folks have asked for a comprehensive list of Scriptures that refute the traditional teaching of hell. While this might not be exhaustive, I’ve put together 25 verses that strongly illustrate what the Bible teaches on the issue. 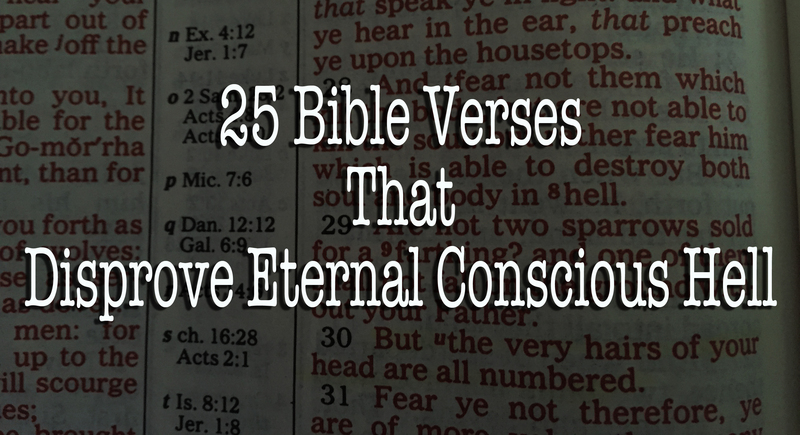 As one will see, to believe in the traditional hell, one will have to directly argue against the language the Bible uses in these 25 passages which unanimously describe the fate of the unjust as being annihilation– not eternity in a conscious hell. If one believes in eternal conscious hell, they don’t believe the ungodly perish at all– but live forever in hell. If one believes in eternal conscious hell, they don’t believe the wicked will be “consumed.” Instead, they believe the wicked and tortured and never consumed. This continues the consistency of scripture which tells us the wicked die– not that they are eternally living in a conscious hell. Of course, if one believes in eternal hell, one doesn’t believe that evil brings death at all, but brings life– in hell. If one believes in eternal conscious hell, they don’t believe those who are lost are “destroyed” but again, that they live forever. To believe in eternal conscious hell means one believes they will not be snuffed out at all. This continues the theme of totally destroyed– there’s not a trace of the wicked. This is the opposite of eternal life in hell. Here God is quoted directly– the evildoers are destroyed like straw thrown into the fire, and nothing is left. This shows total annihilation (they no longer exist). To believe in eternal hell, one would have to argue that God was mistaken and that they aren’t destroyed in the fire at all– but live forever in the fire without being consumed, which is the exact opposite of what God claimed. Here Jesus himself teaches against hell– saying that those who are lost experience the death of their soul. If one believes in eternal conscious hell, they believe Jesus was wrong on this point, and that souls don’t die at all, but will live forever in hell. Again, to believe in hell, one must believe Jesus was wrong in John 3:16 and that people don’t “perish” at all, but live forever in hell. Jesus in his warnings continues with the repetitive testimony of scripture: the consequence of rejecting reconciliation with God is destruction– not everlasting life in torment. There’s that pesky word “destroyed” again. Those who believe in eternal hell don’t believe one is destroyed in hell, but lives there forever. Getting repetitive yet? Seems like the Bible is getting pretty clear that the consequence of rejecting God is destruction, not eternal life in hell. There’s that word again that doesn’t mean tortured in hell, but just means what it says– destroyed. Again, if Paul meant hell, he should have said it– seems like everyone talks about perishing, being destroyed– but doesn’t talk about hell. Growing up we’re taught that the “wages of sin is hell” but nope– it’s perishing, dying, being destroyed.. the opposite of eternal life in hell. Another version of the same term… destroyed. Those who believe in eternal conscious hell don’t believe in the second death– they believe everyone is immortal, and that some will live forever in hell. Rev 20:14 is clear that they die– they don’t live forever in hell at all. So there you go folks– the testimony of the whole of scripture does not testify to hell as a place where you are alive and tortured for all eternity. Instead, from the beginning to the end of scripture we are warned that refusing to be reconciled to God– the author and sustainer of life– results in a natural outcome: the finality of death which is the ultimate destruction. I would encourage you to just read the Bible– and read it without the lens of hell that you grew up with. If you read it without those lenses to distort what you see, you’ll find that eternal hell isn’t what the Bible warns us about– it warns us about a second death. Albeit, I see the inference in the verses you cited that the judgement of the wicked would be finite and complete, there are two verses that would lead me to believe differently. One thing is for certain…as a “Born Again” believer of the Gospel of Jesus Christ, I only need concern myself with the eternal life that awaits and to share that glorious hope with a lost and dying world. Benjamin, please explain what God meant when he described the lake of fire in Revelation 20, where Satan, Death, the Beast and all whose names are NOT written in the Book of Life will go; where there is torment day and night forever. “Scripture is silent on man’s immortality. It is trumpet-tongued on the other side. From beginning to end it positively labours to impress upon man that he is not an immortal indestructible, but a dying, perishing creature; who, if he desires to inherit eternal life, must accept it as the free gift of God in Christ, and seek for it by patient continuance in well-doing. The alternatives of life and death, immortality and destruction, are incessantly put before us in every shape and form. Dogmatic assertions, warnings, promises, arguments, illustrations, and necessary inferences are massed together in such a way that it might have been thought impossible for any human being to misunderstand them. The very object of Christ’s death is again and again declared to be, “that whosoever believeth in Him should not perish but have everlasting life:” yet Scripture we are told, pre-supposes that man is absolutely imperishable, and must spend an everlasting life of some kind, whether he believes or not. It teaches that “whosoever doeth the will of God abideth for ever;” but we are told it pre-supposes that everyone must abide forever either in weal or woe. It teaches clearly that “if any man eat of this bread he shall live forever;” but we are told it pre-supposes that every man must live forever, whether he eat of it or not. It teaches that “the wages of sin is death;” but pre-supposes that man’s spirit is essentially deathless, and that his body having been raised from its first temporary death, can incur no second death, but must live eternally on in weal or in woe. Should God ask me if I thought people should suffer an eternal hell, I would probably say, ‘isn’t that a little long,” but He has not asked me and doubt He will. You know, of course,”we see through a glass darkly.” I think I will follow God’s Word, instead of the Corey Doctrine. As the “sharks” say, I’m out! 1) When Jesus said in Matt 10:28 “destroy both body and soul”, he didn’t use a word that meant cease to exist – the word He spoke (or was written) is used to mean a state of ruin. There is a different word for cease to exist or annihilation. In addition, similar to my item #3 below, Jesus isn’t giving a description of what Judgment Day or eternity will be like – he’s telling you who has what power and whom you should fear, and not fear. So to use this verse as a doctrinal reference to what’s going to happen on Judgment Day is to ignore Jesus’ point and to insert your own. That’s probably not good. 2) Jesus also said in Matt 25:46: “They will go away to eternal punishment, but the righteous to eternal life.” That juxtaposition is completely unambiguous, and is a specific description of Judgment Day and eternity. And is nearly verbatim of what you mocked in this article. 3) Most of the OT examples are not specifically about Judgment Day, and to conflate them with Judgment Day when the context doesn’t call for it is dangerous. Much like what you did in item #1. Maybe I should have put those items together and just had two. I don’t pretend to know with certainly exactly what hell is like. But what I *do* know is what I’ve been told by Jesus: that hell is a real place of punishment where real people will be sent forever. And if I can’t believe Jesus when he said it so clearly and bluntly, even if it seems crazy, then why should I believe that he can forgive sins? Even forgiveness of sins is crazy if you think about it. Your doctrinal arguments remind me of those that Jehovah’s Witnesses would use when I debated them. Have you read up on their doctrine? You’re likely to find some comfort there. One final note: I’ve given you fair warning that you are incorrect and should repent. If you are right, then Jesus’ love will cover the sins of my post and all of my other doctrinal errors. If I am right, then you are in big, big trouble, as this post is reaching out to many and nudging them away from the truth of Scripture. When that Great Day comes, you will not be able to look me in the eye and say “Why didn’t you tell me?” Please change your mind. “2) Jesus also said in Matt 25:46: “They will go away to eternal punishment, but the righteous to eternal life.” That juxtaposition is completely unambiguous, and is a specific description of Judgment Day and eternity. And is nearly verbatim of what you mocked in this article.” – Punishment not punishing. The punishment is eternal; it lasts forever, not the punishing. The wicked are BLOTTED OUT OF THE BOOK OF THE LIVING. Now. You are sorely in need of prayer for further knowledge of the truth.